The assumption that competition law and consumer protection are mutually reinforcing is rarely challenged. The theory seems uncontroversial. However, because a positive interaction between the two is presumed to be self-evident, the frequent conflicts that do in fact arise are often dealt with on an ad hoc basis, with no overarching legal authority. There is a clear need for a detailed and coherent understanding of exactly where the complements and tensions between the two policy areas exist. how consumers are affected by information asymmetries. The ultimate focus of the book is on current and emerging EC law, in which a rapprochement between the two areas seems to be under way. Dr. Cseres provides a knowledgeable guide to the various strands of theory, policy, and jurisprudence that (she shows) ought to be taken into account in the process, including schools of thought and law and policy experience in both Europe and the United States. A special chapter on Hungary, where post-1989 law and practice reveal a fresh and distinctly forward-looking understanding of the matter, is one of the book's most extraordinary features. Competition Law and Consumer Protection stands alone as a committed contribution to bridging a gap in legal knowledge the significance of which grows daily. It will be of immeasurable value to a wide range of professionals from academics and researchers to officials, policymakers, and practitioners in competition law, consumer protection advocacy, economic theory and planning, business administration, and various pertinent government authorities. Table of Contents: Introduction. 1. Law and Economics. 2. Schools of thought in law and economics. 3. 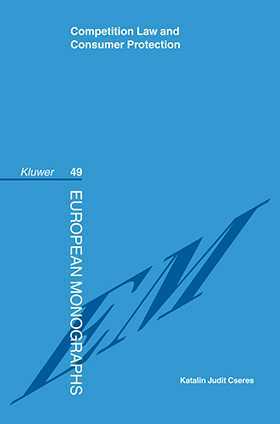 European competition law and economics. 4. Consumer protection. 5. Consumer protection in the European Community. 6. Consumer policy and competition policy. 7. The interface between consumer protection and competition: complementarities, conflicts and synergies. 8. Hungary. 9. Final conclusions. Bibliography. Table of cases. Index.